Wednesday May 22nd 1895 Will had just a little more corn to put in to finish the plowing this morning and the he helped me wash. I got dinner after we finished. I sewed some in the afternoon and did the evening work. went to bed early. 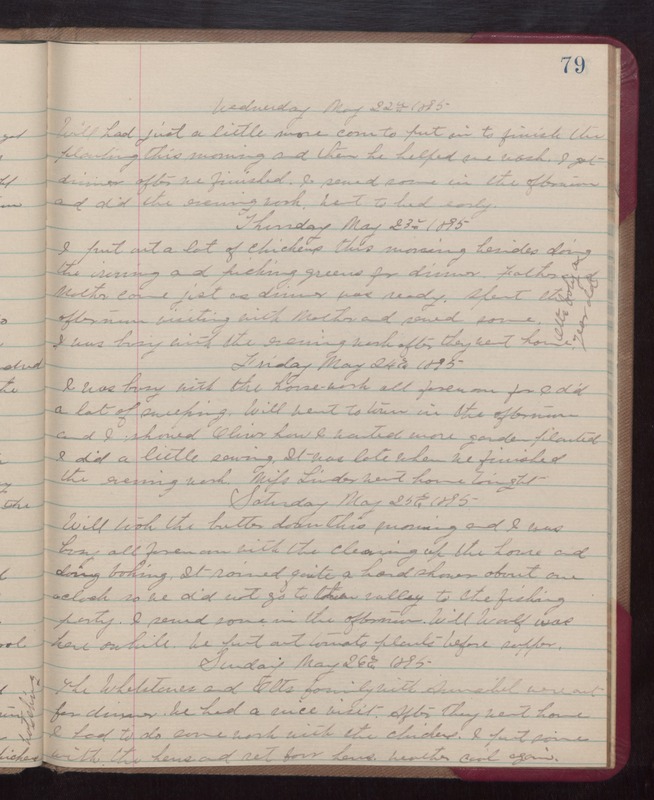 Thursday May 23rd 1895 I put out a lot of chickens this morning besides doing the ironing and picking greens for dinner. Father and Mother came jist as dinner was ready. Spent the afternoon visiting with Mother and sewed some. I was busy with the evening work after they went home. [the following text is written vertically in the right margin of the above text] Otts baby is year old. Friday May 24th 1895 I was busy with the house-work all forenoon for I did a lot of sweeping. Will went to town in the afternoon and I showed Oliver how I wanted more garden planted. I did a little sewing. It was late when we finished the evening work. Miss Linder went home tonight. Saturday May 255th 1895 Will took the butter down this morning and I was busy all forenoon with the cleaning up the house and doing baking. It rained quite a hard shower about one oclock so we did not go to the valley to the fishing party. I sewed some in the afternoon. Will Woolf was here awhile. We put out tomoato plants before supper. Sunday May 26th 1896 The Whetstones and Elts family with [Sunaobel?] were out for dinner. We had a nice visit. After they went home I took to do some work with the chickens. I put some with the hens and set four hens. weather cool again.